Walker, where are you going? Thirteen years ago, there was a young girl in the Colombian town of Tarso with no clear goals or dreams. But one day some people came by her house asking what the needs of her family were, and suddenly a hope for her future awakened. Thanks to the those social workers and two angels, her sponsors, the young girl, Yuli, started to feel motivated in her schooling and improving herself each day. God was granting her opportunities through the people Yuli considered her angels. As the years went on, Yuli, the girl who previously didnít have any aspirations, now had a defined path. She was attending high school as a result of the financial support and encouragement of her angels, and kept focused on the dream she wanted to accomplish, which was to graduate. Yuli, with determination, kept telling herself, ìI will keep on no matter what.î Her efforts were worth it as she reached that goal and after graduation started a career with CFCAís Madre Paula project. She experienced the love of her angels and is grateful to them for the many years of spiritual and financial help. Yuli also thanks God for allowing her journey to cross paths with her sponsors. “Life has great opportunities in store for the ones who assume challenges and take risks. Sponsorship may change the course of a personís life entirely if that person learns to take full advantage of it, but their work does not end there. They must become like a hummingbird that is so skillful in spreading seeds from branch to branch, from flower to flower. There are not limits but definite purposes for the ones that take the opportunity. This reflection was written by Deisy Yuliana Betancur Cardenas, former sponsored child and now a CFCA staff member in the Madre Paula project in Colombia. 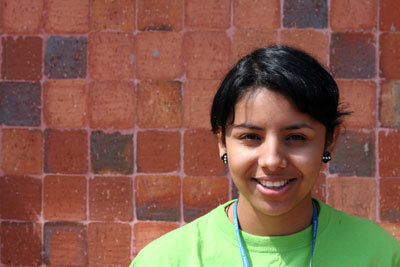 Yuli shared her reflection with participants on a CFCA mission awareness trip in Colombia in May.